In a first for the Indonesian palm oil industry, an independent smallholder association has received certification from the RSPO. 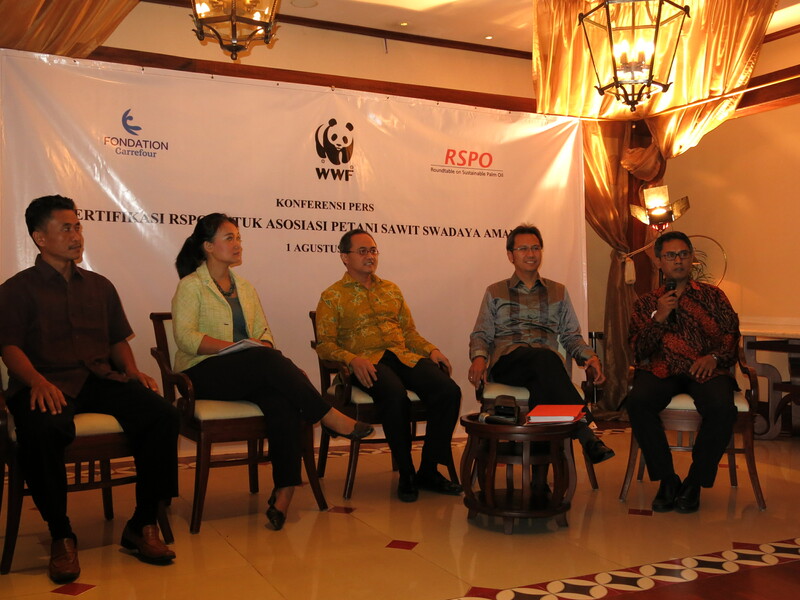 In a first for the Indonesian palm oil industry, an independent smallholder association has received certification from the Roundtable of Sustainable Palm Oil (RSPO). The certification, the second such certification of independent smallholders in the world, is particularly significant in Indonesia where over 40% of total palm oil production comes from smallholder’s plantations. WWF-Indonesia facilitated the formation of the Amanah Palm Oil Independent Smallholders Association with support from the Ministry of Agriculture, the Riau Provincial Government, the RSPO, Carrefour Foundation International, and PT. Inti Indosawit Subur, a subsidairy of the Asian Agri Group. The Amanah Palm Oil Independent Smallholders Association’s 349 members manage 763 hectares of oil palm plantation in Riau Province, where approximately 1.1 million hectares of palm oil plantations are operated by smallholders.